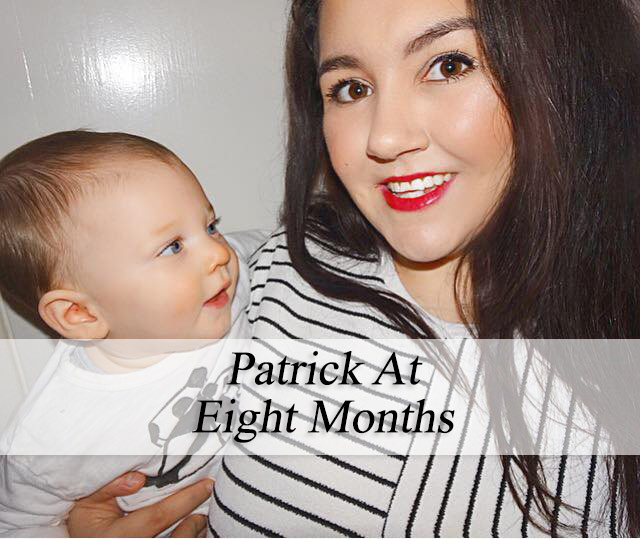 Patrick is officially eight months old and on the exact day he hit that milestone it came with another, he's been earth side longer than he was in my little womb home. It doesn't feel fair, pregnancy went so slow and really dragged out whereas since he has been born it's as if I blinked twice and now we are here. Why couldn't we have swapped those scenarios around? This month you've achieved so much and changed so quickly and I think the next four months till you are one will be much of the same. It scares me that we've just mentioned your first birthday, oh baby where are these days going? So what have you done differently this month? Well, sitting is just a 'thing' now, it happens and we don't have to worry or watch you too much and sneaky little you has worked out how to get yourself from sitting to laying on your front again which both me and Daddy know is a very sure sign that crawling is coming. We were right, crawling has begun though not fully, you're just mastering the fast-worm-army-crawl style, though you are aware you can move up onto all fours and rock back and forth, you haven't quite worked out that if you lift those chubby hands you'll be on the go. I'm in no rush, I know crawling means I need to somehow grow another pair of eyes. Do we have teeth? No, you're still toothless but ruthless because they are giving you so much pain, I can feel them ready to burst out of your hardened gums any day but again, I'm quite content with you staying my gummy bear for a while longer yet. As for food - what don't you eat? I want to give myself a little mum pat on the back because you are such an easy baby to wean, we don't have any chokes or gags though it's as if you swallow everything instantly, you cry when mealtimes are done because you enjoy it so much. I count my blessings that I have been blessed with two seriously good eaters, every single day. Sleep this month has been similar to last and I've found myself slowly getting used to that actually it wasn't a phase, you did just change. I can sigh with relief that we're now back to sleeping all night long, in your own room, in your cot but boy oh boy did you really push me to the brink some nights son, you have most definitely added some age to me, it's lucky I've had you young. I'll wreak my revenge when you are 16 by jumping on your bed at 5am, don't worry my prince. These months always really show a babies personality and you are no different to that, we're learning that out and about you are incredibly happy and smiley, it gains you a lot of attention from little old dears in supermarkets which of course we are more than happy to show you off. You're first trip out of the country happened as we visited not so sunny Wales, I dreaded the car journeys as you quite honestly despise your car seat, but once again you showed us why we shouldn't underestimate you and behaved so well it was as if we didn't have a baby with us at all, not a peep. I noticed this month you are quite fond of Daddy I mean obviously he is your Dad so you are bound to, but given that most of your time is spent with me, you're still incredibly happy and excited to hear his voice each evening when he walks through the door, you've even begun to do a little grunt that we recognise every time you get excited - it is SO sweet. As for your brother, with each waking day you two are more hilarious, two complete peas in a pod and I thank our 2015 selves daily that we decided to give him a sibling as I just know you are going to be best friends. You find him so comical, even when he is being a bit of a pin and quite lairy, you don't care. Watching you two growing side by side is the best privilege. So there we have it, you have been with us for seven whole months, this has been your home longer than I was and I'm intrigued to see what new will be happening with you in our next update. How much has he changed since seven months? What an absolute cutie! Sounds like he is doing so well. Glad the sleepless nights are over for you. Side note- your teeth are so white! What do you use? I love his name! sleepless nights - I still get those and my youngest is 3. I love these updates! It's so amazing to see the differences in our boys when they're literally a week in age apart!